Seed exchanges or swaps are a great way to bring the community together. 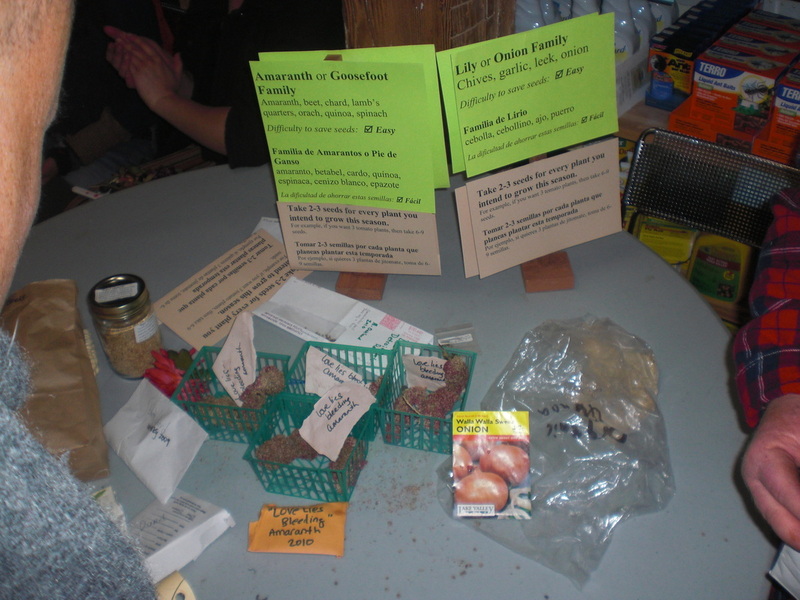 The Community Seed Network has a helpful resource on How to Organize a Seed Swap. Below are the resources created by Richmond Grows Seed Lending Library about hosting a seed swap. We co-hosted a swap with BASIL in Berkeley that has over 150 people attend, a potluck, and live music. Take what's useful. Tweak it. Make it your own. If you have any great ideas or pictures, please email richmondgrows@gmail.com and we'll add it to this site. Seed swaps can be a feeding frenzy if the tone isn't set. Before starting, explain the purpose of the swap. Give thanks and gratitude for the seeds, the ancestors who saved them, the folks who are sharing them tonight, and whatever else feels appropriate. Set some expectations about how much folks should talk (see sign above "Take what you need") and a reminder that the information they write on the packet is important. It's worthwhile having a large poster showing an envelope that has good information. 1. Start the swap by explaining that seeds are labeled by seed saving level and that you are encouraging everyone to start with the "super easy" plants. 2. Have plenty of "super easy" seed saving brochures available. Have people pass them out as folks enter the event or have them on the table. Here are the English and Spanish (in process of being edited) super easy brochures. Feel free to put your own contact info on the brochures, but please leave the piece about "Create a library" and our URL. 3. Have people who are seed savers wear a badge that says "Ask me about seed saving" or some type of identifier. 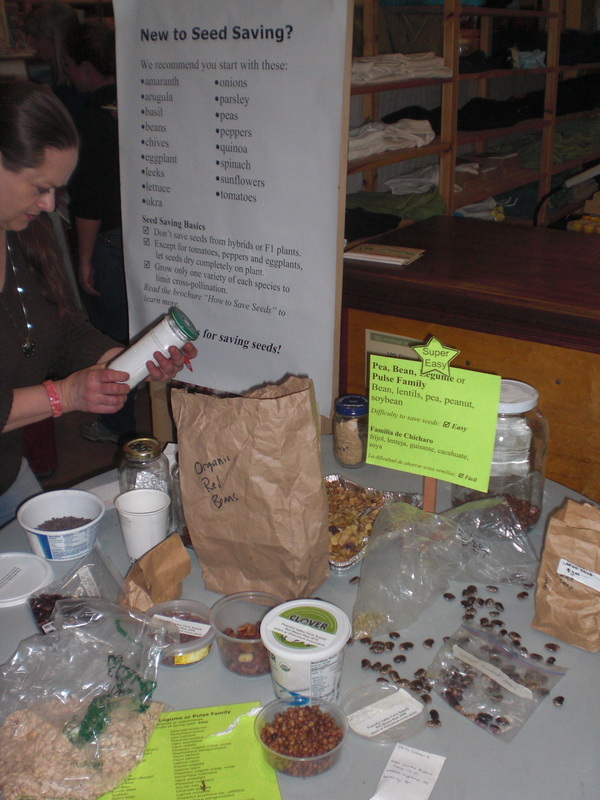 Let folks know in the beginning of the event that there are folks who can answer questions about seed saving. If you have a seed lending library, have folks who volunteer at the library have badges too so folks can learn about the library. 4. Let folks know that if they are bring cucurbits they need to write "hand pollinate" on the package if they did hand pollinate. In the beginning, and also volunteers, can check in with folks putting on the table and asking them to identify "hand pollinated" or "may have crossed." 5. Have a class at or before the swap about seed saving. 6. Every 20-30 minutes remind folks about the super easy plants and encourage them to ask someone with a badge about seed saving. If you have a library and it's in the same building give tours at regular intervals throughout your swap. 7. It's also helpful to have volunteers remove any sweet peas (Lathyrus odoratus) from the pea and bean family area and put them with flowers instead.